This entry was posted in Racing on October 3, 2011 by Steve Tilford. Yesterday was perfect bike riding weather. I love the fall. The cool, crisp mornings that heat up to nearly perfect temperatures. That was yesterday here in Kansas. 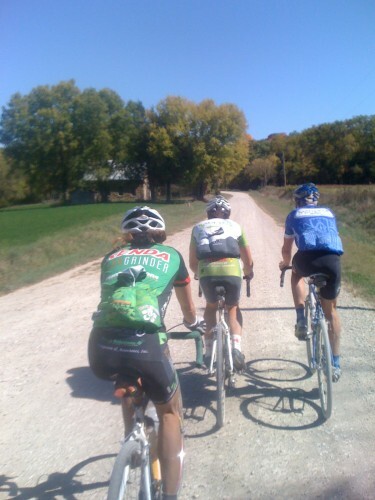 I went over to Lawrence and did a perimeter loop of Douglas County on gravel with a bunch of other guys. There were probably 25 of us or so at the start. 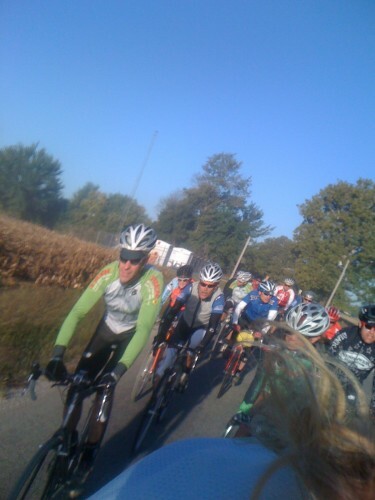 Some weren’t doing the full 100 miles, but wanted to get a good ride in before family obligations got in the way. Anyway, no matter how far you went, it was a real nice day to ride a bike. I’ve done this ride the past 4 years and this was by far the nicest weather for it. Eastern Kansas isn’t as flat as one might think. It rolls pretty good. We rode on a lot of pretty primitive roads. They weren’t dirt, but they didn’t receive gravel or maintenance on any kind of routine basis. I love those roads. Only maybe 10 cars passed us the whole ride. It hasn’t rained here for a long while, so when a car did go by, there was quite a dust plume. It was 65 miles before we stopped for lunch. That is a good way to split up a long ride. 2/3, 1/3. I never would normally stop and eat a full lunch out training, but this wasn’t training, it was riding. Thom Leonard got a bunch of bread from WheatFields, brought cheese and meat. The only thing we were missing was red wine. It was hard getting going after lunch. A lot of guys decided to just roll back to town, so it all split into smaller groups, which was fine. All and all, a perfect way to spend a Sunday. 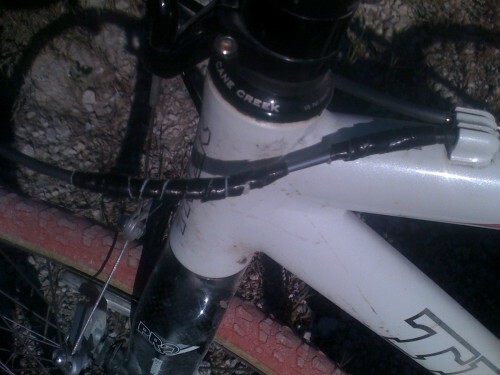 I have no regrets not going over to KC to defend my Boss Cross lead. I was/am mildly crippled from Saturday’s race. Probably all the running in the sand and the bumpy course. Whatever the reason, I made a good decision to spend the whole day out on my bike with friends. 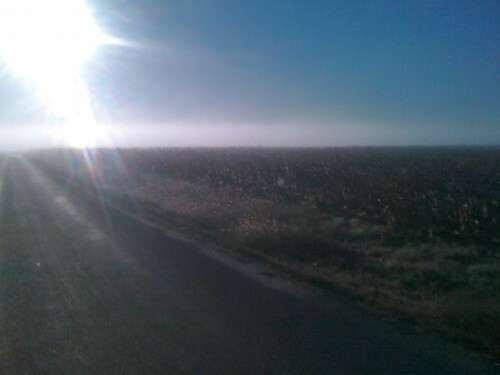 We were riding in and out of fog early on the ride. A photo of the group from over my shoulder. I can't believe I actually got a picture of Dan Hughes here (All black a couple guys back on the right). Dan spent maybe 5 miles total riding with us. I'm not quite sure what he was doing the rest of the time other than going real fast all day long. Bill's rear shift cable exploded and he was stuck in a 14 for a hour. Then I remembered I had some Gorilla tape with me for a boot and he was back in business the rest of the day. 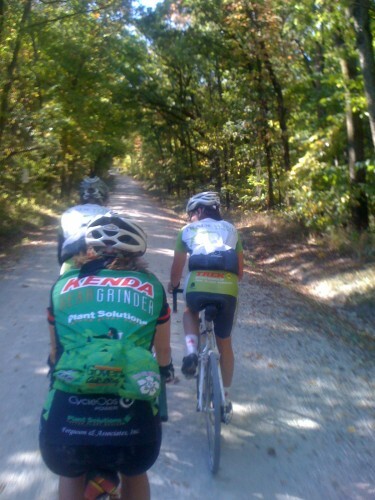 Most of the ride was out in the open, but there was a fair amount of tree covered climbs. Brian and Catherine at an overlook. The trees are just starting to turn. 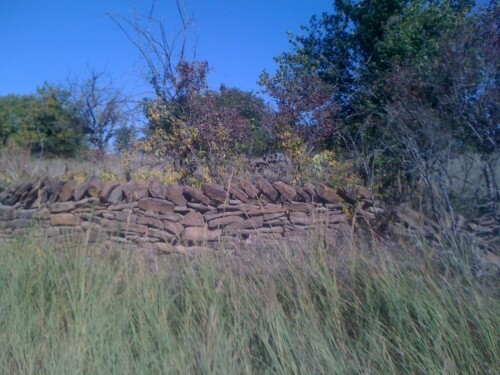 Lot of the roads in Northeastern Kansas are lined by these stone fences. They were constructed by the early settlers and through the century up to German POW's during WW2. This is a good example of what we call hedgerow here in Kansas. 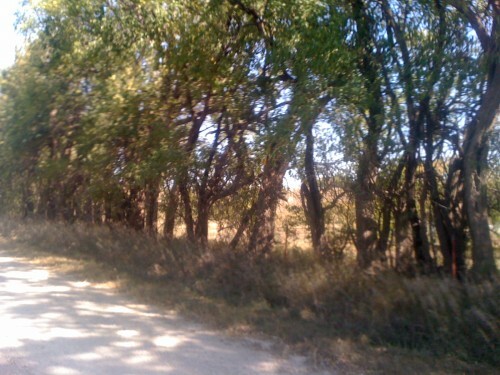 It is really Osage Orange trees, but we still call it hedge. The wood is super hard and dense. It was said back in the Indian day, that a good hedge bow was worth two horses. Shows how hard it would be to make a bow out of hedge back then. Coming back into Lawrence everything is much more organized and sculptured than out in the country. Man, moving away from Kansas made me realize just how much I like riding gravel; my favorite type of riding by far. Gorilla tape is the bomb. I use it for all of my ghetto-tubeless setups. Tears into perfectly straight strips of whatever rim width I need. Gorilla tape rules. I use it at school almost daily for various projects. I also use it for building up my rim beds for ghetto tubeless (rather than the overpriced Stan’s). It tears into perfectly straight strips of whatever width I need, is waterproof, and has never failed me (Hutchinson Pirahna/Bulldog tires, otoh…). In Tulsa now, but that golden corn and flat road in the first photo is very reminiscent of my youth out in Dodge City. I love this time of year, and can almost feel that Kansas (harvest) air! Western Kansas is so flat. Something I thought I would never miss, but I do at times. u r lucky very nice ridewith great scenery. People in Iowa would call those crushed rock roads, gravel is actually alot of round pebbles & small rocks and has an orange color as opposed to the white gray of a crushed rock road. not many true gravel roads left because they are more dangerous than the crushed rock.